I am interested to hear what the folks down at Atari Age think about collecting game manuals. Do you collect manuals for all games, or only certain types of games? Where do you keep them (storage)? If you try to avoid manuals for loose games, why? I'd love to know. For me, I like to get manuals for a few types of games. Especially RPGs, or Atari 2600 games that might need some explaining without previous knowledge (Yars Revenge). I also keep my manuals in a big ziploc bag in my desk drawer. Nothing fancy. Oh, and I avoid manuals sometimes (to save space, and to save on costs), usually I only get them when I mean to, or if it seems like a bonus. Excited to see your opinions! I like to get the manuals, and the box if I can, but I don't go out of my way. As for the ones I got, I keep them in the box if I have one, or in a larger plastic bin (like a tupperware version of a shoebox) to keep them clean and dry. I almost never use manuals. Most games are pretty self explanatory, but the manuals are often a fun read even if you don't really gain anything from them, gameplay wise. Drives me nuts modern games don't have manuals, the less self explanatory they are, the more they really need one. Sure, you can "download" it, or some games have them on the game itself, somewhere, if you can find it, though it requires you to get out of the game to us it. If nothing else, you have to print a cover anyways, why not use clear cases and print a quickstart if nothing else on the inside of it? Finding manuals, especially for older handheld games is pretty hard. So they aren't necessarily something I activity collect for. However, I have found some larger stores as well as at Expo's (like PRGE), and when I find manuals for games I have (and the price is reasonable) I will get the manual(s). Most of the times the games I have are loose, so it isn't that big of a deal for me, yeah, I wouldn't mind having the box, but I have no place to store them. Loose manuals, work perfectly, small and easy to store. (I just store them in a plastic bin) For consoles (like the Genesis and Dreamcast), I get boxed and especially for Dreamcast, they must have manuals. Most of my boxed Genny games have manuals too, and I will walk away from a game if there isn't a manual. Personally though, I love manuals and collecting them. There was always that joy of opening a box up and leafing through the manual before firing the game up. I came pretty late to the physical manual game, but man I still miss 'em. When it comes to disc-based games, having a manual is essential, unless the game never included a manual to begin with (a disappointing modern development). I'm more flexible (or should I say, "pragmatic") when it comes to cartridge-based games. For some systems, such as the VCS, I've tracked down manuals for nearly every game I have. For other systems, such as the SNES, I couldn't care less about having manuals. If you don't have a manual (or box) you don't have a complete game. It's like a music CD without inserts or jewel case. I only actively collected cases/manuals for disc-based games, and handhelds from the DS-era on. This is largely due to the MASSIVE expense of trying to have them for the older games- quite often getting a 'complete' copy means doubling the price. For some systems, like the Genesis and Master system, I have the space & the cases are great, so I get complete when I can. For others, like the Atari 2600, space is a big issue, so I skip it. I do find myself often coming here to check the manuals for new acquisitions I don't know how to play... but it's never something I can't remember going back to it later, so I don't mind. I bring up cases because the completionist in me likes to keep everything related to a game as together as feasibly possible, so if I have a manual, I usually hunt down a case (and vice-versa.) When I graduated from high school, I got a nice planner that came in a fairly heavy plastic box that just so happens to be the same height/length of a sega CD box. 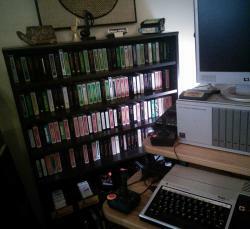 The loose manuals and papers I do have go in there, and stay with the sega CD games. Considering I have a few pack-ins for that whose case design won't allow the manuals to ever be kept with the games, it seems like a good solution. I LOATHE that so many new games don't come with manuals. From a function standpoint, it kinda-sorta makes sense on the Vita- the interface for that allows very easy access to the on-game manual. But on other systems, like the PS4? It's awful. There's nothing intuitive about accessing an on-disc manual, you're stuck with nothing to interact with while the inevitable 20 minutes to an hour of startup patch downloads happen... not to mention the sheer difficulty of shopping for any version of the game other than shrinkwrapped brand-new. I've only had my PS4 a few months, and I've already spent way too much time standing in a gamestop, a used case in my hand, looking up Ebay listings on my phone to see if there's a manual I should have. I do have to give props to Square Enix... they added 'physical manual' to the info box on the back of their games, so it's far easier to check on that. Edited by HoshiChiri, Mon Apr 4, 2016 6:54 AM. I keep my manuals in binders with protective sleeves. I'm thinking of putting up the collection on eBay however because they just take up shelf space. A binder is a sweet idea for keeping loose manuals for nes/snes/2600 games. Thanks! There is nothing worse than having a game for which you can't figure out the controls...which is why I like manuals. Loose manuals are annoying but I try to keep them in the game boxes I use for storage (be it UCG's or). 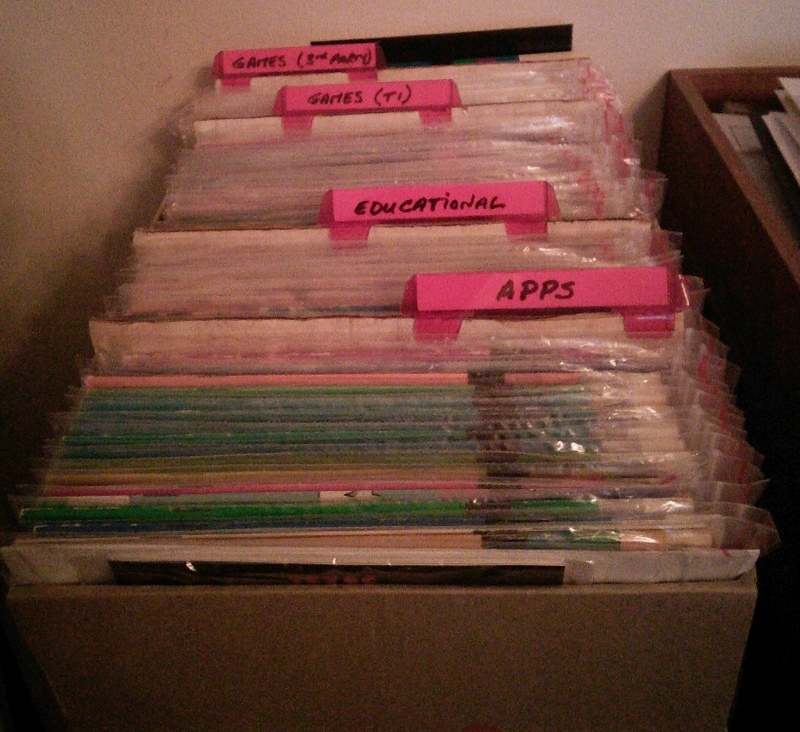 But otherwise I am moving toward keeping them in plastic protective sleeves in binders. The lack of manuals being included is definitely a part of why I am not longer into "modern" gaming. But you could just go to Digital Press' www and look at the text or PDF scan of the manual. I don't know if they have all the manuals but I can tell you there isn't one I haven't been able to find. 3) "quality" of playing experience -- this is a vague requirement, but is usually directly correlated to how "real" the playing experience is and how comfortable the controls are to use. So yeah, manuals aren't high on my list. That's how I do it. I have multicarts for every system in my collection where one is available. I have zero attachment to individual carts - I just want to play the game. Waiting for a multicart to be released for the 7800, INTV, TI-99/4A and Lynx and I'll be set. This ^^^^^^^^^^^^ I have no need for them when I can find it on the web. I always love reading through paper manuals, but I tend to only collect them for the original PlayStation and Nintendo DS games; since those are two systems that I always get games complete in box for. Back when I used to collect Atari 2600 games I would get the manuals for games that I felt required them to learn how to play the game properly (Star Raiders, Riddle of the Sphinx, etc. ), bust most of my games I never had the manuals for and just looked them up online when I needed to figure out the differences between game variations and such. In short: I do like having paper manuals, but at this point the only time I get them is when I'm collecting for systems that it's cheap and easy to find games for complete in box. 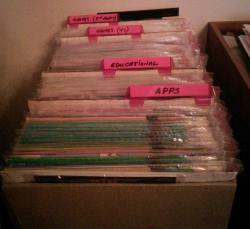 I do use the web to find manuals, (and keep a collection of PDF manuals actually!) but if it is at all convenient I try to grab a hard-copy as well. Is there a good site that has well indexed game manuals, sort of like the cover project but for manuals? I'd use PDF more if they were easier to find in a standard format and size. Yes, I do like having manuals. A game isn't complete without them. Especially since the manuals often have important background and control-scheme information. The lack of manuals in modern games serves only to alienate those used to having them, and raise questions as to what other corners were cut with the game. I have an Atari 2600, an original PlayStation, and a PS 2. I have manuals for almost every game in my collection. The Atari manuals are stored in file folders; the PSX and PS 2 manuals remain in the original cases with the games. Under normal circumstances, I will not purchase a game that is missing a manual (and/or the original case). I do have a few reproduction manuals (colour printing FTW) for especially rare games that I have no expectation of finding again. As a Canadian collector, some PS 2 games include a translated French-language manual, as well as the original English version. I keep both copies. Although personally I don't collect any manuals, I do miss having them. I remember that during the PS2 era, the first thing I did whenever I got a new game was to look at the manual. Some of them were amazing. A well-done manuals is a work of art, in my opinion, which makes me so sad that modern manuals are as barebones as possible if it even exists at all. Remember the manual to Legend of Zelda? The backstory, the illustrations, the thoroughness! Reading that thing would instill you with such a big sense of adventure before you even popped in the game. My favorite manuals of all time though are those to the Donkey Kong Country games, all because of Cranky Kong's sarcastic quips laden throughout. "Notes? Who even uses these pages? A waste of paper if you ask me!" As far as collecting goes, though, I'm not too picky about manuals, since most of them are available online if I need to reference it. I'm a very utilitarian collector, I only really collect games that I actually like and that I'll actually play. I'm not a big completionist in that regard. Depends on whether you're a collector or just an enthusiast. Some folks don't even need the disks/cartridges...just an SD or Compact Flash filled with as many titles as they can download is good enough. As long as they're accessible they don't care what physical software they have. Others place a high value on having sealed boxes with all the goodies safe and sound inside, never to be seen by human eyes again. Me, I slice the shrink wrap immediately (shrink wrap damages more frail boxes with time - it's called 'shrink' wrap for a reason), and remove the contents. I figure all cartridges should be plugged in and played at least once - even if I have a digital copy as my primary use version. I also like to display my collection. 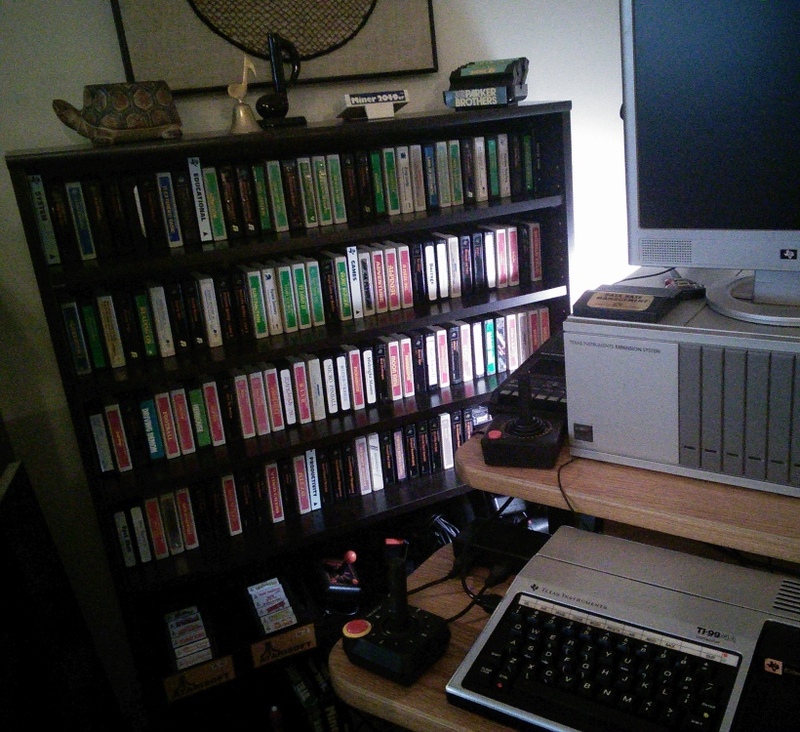 The carts I then put in an audio-cassette bookcase (found a six-shelf unit from Sauder* that fits EXACTLY 35 carts per shelf like it was made for them). The boxes are displayed in bookcases and wall shelves. Except for TI-branded boxes which are generic and not worth displaying - I really don't even care if I get a box when buying TI released carts (except for the binder-enclosed ones). The manuals and instruction cards are kept in sealed zip-lock bags (bought 1000 6x9 bags in bulk for next to nothing). Most TI manuals are exactly the right size to then be placed in mens' shoeboxes (kinda like a mini version of a comic book store bin). So it all depends on how you view your collection. One thing is certain...paper products NEED to be sealed or they dry out, yellow and eventually fall apart. My mother left me hundreds of 1940's Hit Parader magazines (music fan mags with lyrics of popular songs) but she just kept them stored in boxes. I opened one of those boxes a few months ago, and it was sad how badly these 70-80 year old magazines had disintegrated. They are literally worthless now (pages fall apart in my hands as I flip through), but could have been saved easily by sealing them before boxing them (never assume mother knows best). So if you DO keep manuals, zip-lock (or similar air tight storage) is a must. They might look just a bit yellow after 35 years, but what about in another 35?? ?